Metropolitan Hilarion’s parents – his father Alexei Kapral, and his mother, Euphrosynia (née Kasyaniuk) – were from the village of Obenizha in Volyhn , Ukraine . In 1929, during the Polish occupation, the local populace was persecuted and oppressed by Poles attempting to turn Western Ukraine into a Polish province. Thus, the 19-year-old Alexei and his young wife decided to emigrate to Canada . At the time, the Canadian government afforded immigrants the opportunity to obtain large tracts of land in Western Canada ; it was there that the young family settled. Upon their arrival in the province of Alberta , the Kapral family received 160 acres of untilled land, as well as $100 in cash, a hammer, and an axe, with which to build themselves a home. In the developing Spirit River region, there were some 200 Ukrainians, and in view of the oncoming cold, they quickly built themselves houses. The great economic crisis of 1929-1930 affected the settlers as well, making an already hard life even more difficult. To find work, Alexei Kapral had to travel far from home, and he earned but 25 cents per day. Nonetheless, the family grew ever larger – five boys and two girls filled the house with children’s voices, speaking Ukrainian at home. Their parents also spoke Russian and Polish. The youngest member of the family was Igor, the future Metropolitan Hilarion. He was born on January 6, 1948, in Spirit River, and spent his childhood in the country. He had to walk over three miles to school every day. Later he transferred to another school in Blueberry Creek, but returned to finish high school, which he graduated in 1966. From his youth, Igor attended Holy Trinity Russian Church, located close to Spirit River. There were many conflicts among the parishioners, some of whom wanted the church to transfer to the Ukrainian Autocephalous Church. The parish later transferred to the diocese of Archbishop Panteleimon (Rudika), who served first in the Russian Church Abroad, later switching to the Moscow Patriarchate. Young Igor, meanwhile, found a spiritual father in the Russian Church Abroad, in the Right Reverend Sava (Saracevic), Bishop of Edmonton, a Serb who greatly revered our Holy Hierarch St. John (Maximovitch, +1966). From his youth, Igor felt drawn to the Church, and loved to read books and periodicals on religion and morals. In 1967, when Igor Kapral was 19 years old, he entered the Holy Trinity Theological Seminary in Jordanville , NY , USA . On graduating from the Seminary in 1972 (together with our rector, Fr. Victor – ed. ), Igor entered the Holy Trinity Monastery as a novice. On December 2, 1974 he was tonsured a rassophore monk with the name Hilarion, in honor of Venerable Schema-monk Hilarion of the Kiev Caves, the famous Metropolitan of Kiev. On December 4, 1975, Archbishop Averky (Taushev, +1976), for whom the future Metropolitan served as a cell-attendant, ordained him a hierodeacon. In 1976, Bishop Laurus of Manhattan ordained him a hieromonk. The same year, Fr. Hilarion received a Master’s degree in Slavic studies and Russian literature from Syracuse University. The future First Hierarch worked simultaneously as editor of the English-language version of the magazine Orthodox Life, and as a typesetter for the monastery press. On December 10, 1984, His Eminence Metropolitan Philaret (Voznesensky, +1985) and nine other bishops officiated at the consecration of Hieromonk Hilarion to the episcopacy. As Bishop of Manhattan, His Grace was also responsible for the parishes of Pennsylvania, and was also appointed the Deputy Secretary of the Synod of Bishops by the Council of Bishops. Ten years later, thanks to the archpastoral efforts of Bishop Hilarion, the number of parishes in the Eastern American Diocese grew to 64. Visiting parish after parish, Vladyka drew the love and respect of all those who met him. Holding a position of responsibility in the administrative center of the Church Abroad, Vladyka Hilaron was also an active participant in the main events of its history. 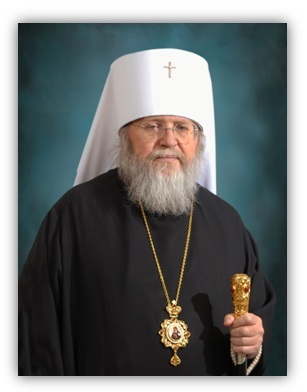 In 1995, Bishop Hilarion was given the title Bishop of Washington as he continued to live in New York, but due to problems in the Diocese of Australia and New Zealand after the retirement of the ailing Archbishop Paul (Pavlov), and in recognition of his exception pastoral talents, Vladyka Hilarion was elevated to the rank of archbishop and appointed Ruling Bishop of the Diocese of Sydney, Australia and New Zealand. In 2003, Vladyka Hilarion was awarded the right to wear the diamond cross. During the Council of Bishops of the Russian Orthodox Church Outside of Russia in 2006, he was appointed First Deputy President of the Synod of Bishops. The future bishop George, Paul Schaefer, was born on May 25, 1950, in Belleville, Illinois. He graduated from Catholic High School in 1968 and then attended Southern Illinois University from 1968 to 1972. In 1974 he was received into the Greek Orthodox Church in Modesto, CA, and given the name Makarios in honor of Saint Makarios the Great. He joined the Russian Church Abroad in San Francisco in May 1975 and entered Holy Trinity Seminary in Jordanville, New York in September 1975. On Christmas, January 7, 1976, Makarios was made a novice by Archbishop Averky (Taushev). As a novice his obediences in the monastery were working in the farm and cemetery. After a few years in the monastery he was made a riassophor monk on Friday of the First Week of Lent, 1979 and tonsured to the small schema on Friday of the First Week of Lent, 1980, and given the name Mitrophan in honor of Saint Mitrophan of Voronezh. He was ordained a subdeacon on Palm Sunday of the same year. In 1980, he graduated from Holy Trinity Seminary. Fr. Mitrophan was sent to Mount Athos by Archbishop Laurus in June of 1981. He was tonsured to the great schema by Hieromonk Nektarios of Koutloumousiou Monastery, Mt. Athos, and given the name George in honor of Saint George the Great-Martyr. In February, 1986, Fr. George returned to Holy Trinity Monastery and started working in the Printshop of Saint Job of Pochaev in 1986, where he worked until 1998. He assumed editorial duties on Orthodox Life in 1992. Fr. George was ordained a hierodeacon on the feast of St. Michael, 1986, and a hieromonk on Palm Sunday, 1987. In September 1998 he was elevated to the rank of abbot and archimandrite on the Feast of St. Job of Pochaev, 2005. In 1994, he was appointed as economos of Holy Trinity Monastery and made dean of Holy Trinity Monastery in 2007. He is the author of several articles and translations published in Orthodox Life. He translated the sayings of the Optina Elders published in the book “Living without Hypocrisy,” published by HTM Press in 2006. He served as confessor and spiritual father for Holy Trinity Monastery and for the Hermitage of the Holy Cross in Wayne, West Virginia, the largest English-language monastery of the ROCOR. 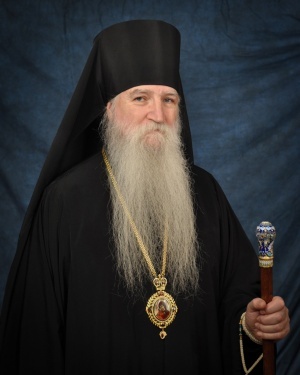 In May 2008, the Synod of Bishops of the ROCOR elected Archimandrite George as Bishop of Mayfield, Vicar of the Eastern American Diocese. The Holy Synod of the Russian Orthodox Church confirmed the election in June 2008. On December 7, 2008, Archimandrite George was consecrated to the episcopal office at Holy Trinity Monastery in Jordanville, New York, by Bishop Gabriel of Montreal and Canada, Bishop Peter of Cleveland, and Bishop John of Caracas. On October 7, 2014, the ROCOR Synod of Bishops appointed Bishop George as vicar of the Australian Diocese, with the title “Bishop of Canberra”. Bishop George officially moved to Australia on April 15, 2015.